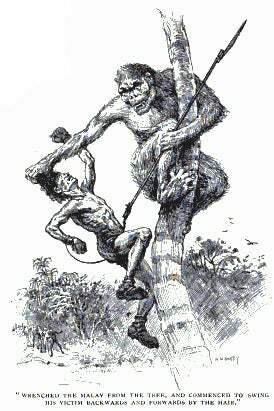 "The Hunt for the Man-Monkey", written by English essayist Percy Longhurst in 1901, is a very curious account of a cryptozoological expedition, said to have taken place in Borneo during the 1880s, that ended in violent tragedy. Longhurst was a prolific author whose works ranged from textbooks on wrestling and self defense to juvenile adventure stories. "The Hunt for the Man-Monkey" is not presented as fiction, however, but rather as a sober account of an actual event, as related to Longhurst by a Captain Bywater, who was present during the hunt. Bywater had been asked to captain a steam yacht owned by a wealthy gentleman who wished to take his friends on a cruise among the Malaysian islands. One of the party had heard stories about the Mai-as, a large, reclusive and dangerous ape-like creature said to inhabit the dense jungles of Borneo, and they decided to try to capture one for the London Zoo. ... they neared the locality wherein it was supposed was the home of the Mai-as. The Dyaks and Malays spread themselves out in advance of the party of Englishmen, beating the forest, and all the while keeping a sharp look-out for the dreaded man-monkey. All moved with the greatest caution, and the keen, anxious faces of the natives showed that they considered the business in hand to be no child's play. Presently a loud shout from one of the Dyaks brought the party up all standing, and with their fingers on the triggers of their rifles (for there was no telling how the Mai-as might resent their intrusion) the Englishmen advanced to where the native had perceived the hideous animal standing at the foot of a tree. Slowly the Mai-as began to climb the tree, in the lower boughs of which could be seen his house, constructed of thick branches cunningly interlaced. Then began the trouble to induce him to descend, and if possible to drive him to the open country; for in the dense forest there was but small chance of surrounding him and taking him alive, as the Englishmen wished. Stones, clods of earth, and sticks were hurled at him, and then he leisurely descended. As his assailants hurriedly retired he reached the ground and disappeared along one of the forest paths. At first glance, the "Man-Monkey" narrative reads like an expedition to capture an orangutan. However, the Mai-as is presented as being a rare and little-known animal, and specifically not an orangutan. Like gorillas, orangs had been comparatively well-known in Europe for at least a hundred years by 1901, being described and illustrated in numerous books and articles throughout the 19th century. An orangutan is even revealed as a murderer in Edgar Allen Poe's famous short story "The Murders in the Rue Morgue", which was published in 1841. The words mias, myas, mawas, etc. are given as cognates of the term "orangutan" in the Dayak language in numerous late-19th century journals. The European literature of that period also frequently glosses orangutans as "man-monkeys". So; what, exactly, was being hunted? It may be that Longhurst's story is a basically accurate recollection by Captain Bywater of an attempt to capture a large ape in the Bornean jungle, but that Bywater and his associates mistook the Dayak name Mai-as as the name of a rare species, and were so unfamiliar with orangutans that they believed that the animal they encountered was unknown to contemporary science. The Dayaks themselves, told that they were hunting Mai-as, would presumably have taken everything else for granted. In strength and bulk, although not in height, he is superior to the terrible black gorilla of Central Africa, while in appearance, at a short distance, he looks like a short and very broad native, being a brownish-black, and standing about 4 ft. high. In the face he is far less repulsive than his neighbour the orang-outang or the chimpanzee. Hard at his heels came the hunters, until the Mai-as caught sight of a solitary palm tree not a mile away. Reaching it he climbed up, in spite of the slippery trunk and the absence of branches. About 30ft. above the ground the creature stopped, and, holding on by his arms and legs, watched his pursuers, who, having treed their game, were now engaged in discussing how to secure it. It was suggested that the tree be cut down and the Mai-as secured as it fell, but no tools were at hand, and no one, moreover, felt at all inclined to risk a hand-to-hand encounter with the huge animal. At last it was decided that the Mai-as be induced (if possible) to descend from the tree, and then, after breaking its leg with a bullet to disable it, to attempt to stun it by a blow on the head, and while insensible to bind it with strong ropes. It was by no means a satisfactory plan, but the Englishmen were anxious to secure the brute, if possible, alive. And no other method of doing so suggested itself. This having been settled, the next move was to get the Mai-as down. There was nothing to throw at it and, according to the natives, its strength was so great that it would be able to remain in its present position for an incalculable period. At length, tempted by a bribe of 200 pounds, a young Malay offered to climb the tree, and by irritating the animal induce it to descend. The brave fellow first fixed on his hands and feet coverings of hide with strong thorns fixed therein to enable him to get a hold of the slippery bark, which offered no projections or footholds whatever; and taking with him a "shooting-iron," he resolutely began the ascent. This "shooting-iron" is really a blow-pipe, somewhat similar to that used by the Indians of the River Amazon, but having a sharp spear-head firmly fixed at one end in such a manner as not to interfere with the passage of a dart through the hollow pipe. Breathlessly the onlookers watched the young man as, foot by foot, he crept up the tree, until when within about 8ft. of the Mai-as (who so far had showed no inclination to move) he raised his weapon and prodded the animal in the leg, whereupon the huge creature retreated higher up the tree. The Malay crept after him, and repeated his spear-thrust, and again the Mai-as retreated, while the daring hunter followed him. Afraid that the tree would not bear his ponderous weight if he went any higher—it was already beginning to sway dangerously—the Mai-as stopped and, leaning down, stretched out one hand, and with a lightning-like movement grasped the iron spear - head. Then he commenced to pull, and hand over hand, hanging on solely by his muscular legs, he commenced to haul up the wretched Malay, who was powerless, the blow-pipe being attached to his wrist by a strong leather thong. Little by little the powerful brute drew up the man until, holding the blowpipe with one hand, he reached down with the other and wreathed his huge hand in the thick, luxuriant hair of the miserable native, who, paralyzed by fear, could do no more than gaze at the savage face of his captor with terror-stricken eyes. Spell-bound with horror, the Englishmen below then saw the Mai-as with a single twist wrench the Malay from the tree and commence to swing his victim backwards and forwards by the hair, chuckling all the time with fiendish satisfaction. Too fascinated with horror to use their rifles and slay the monster or else kill the man and put a merciful end to his sufferings, the hunters watched the wild man swinging the Malay faster and faster until, with an unearthly yell of devilish malignity, he hurled him down. The wretched man turned over and over as he fell, and came to the ground with a heavy thud that sent a sickening thrill through the hearts of the watchers. They rushed to the spot, but it was too late—the man was stone dead. Furious with rage one of the Englishmen raised his rifle and, hastily sighting, fired. The bullet struck the Mai-as fairly in the ribs under the left arm, and with a cry the brute slid to the ground, where for one- brief moment he supported himself against the tree, with one hand on the wound. Then with a groan, quite human in its intensity, he pitched forward on his face, dead. It should be mentioned that the party, after the unsuccessful hunt related, relinquished the idea of securing a live specimen, and the dead body of the monkey having been skinned and the flesh removed, the skeleton was brought back to England, where it remains in the possession of the owner of the yacht who had organized the expedition.